Summertime can sometimes call for a cliche getaway to a sunny spot that offers you the opportunity to tan, sip on fruity cocktails, spend time doing absolutely nothing on a sandy beach, and indulge in water sports under the sun’s rays. It’s hard not to succumb to this allure, especially if you’ve been in desperate need of some Vitamin D. But how about taking that summer trip to a more untouched and exciting destination? There’s plenty of sun, sand, and sea that has yet to be discovered by mass tourism, so why not get there first for your very own little slice of paradise? Grenada, Carriacou, and Petite Martinique are three mirage-like islands that make up the Caribbean state known as the “Island of Spice”. A visit to this virgin region excites all the senses, from the scent of its nutmeg and mace crops, the heat and humidity that envelops you within the rainforest patches, to the visual quality of the underwater sculpture park, and finally, the overall peaceful tropical atmosphere. On the one hand, Grenada possesses a charming culture -- fusing the old and new in their quaint yet lively villages and towns, and boasting a natural beauty in its beaches and waters -- while Carriacou and Petite Martinique boast stunning coral reefs, ideal for scuba diving and snorkeling. With the intermingling of rustic African charm and secluded beaches - the magnificence of this summer destination comes from its charisma. Like Grenada, Carriacou, and Petite Martinique, Zanzibar is known for its spice. Its intriguing sleepy island feel along with its swaying palm trees and coral reefs are just a few of the reasons that make the island one of East Africa’s finest beach destinations. If you’re looking for even more of an off-the-grid island hideaway, the surrounding islands of Zanzibar Island will provide just that. The 378 islands of San Blas strewn just northwest of the Panamanian coast form an archipelago that has been wholly undiscovered by the tourism industry, in large part because it remains under the control of the native Kunas. The turquoise waters and the islands’ delicate yet bustling ecosystem create a visual definition of paradise, and the opportunity for water sports like surfing, diving, and swimming are endless. Getting to the San Blas islands isn’t easy, which is why it has been preserved so well, but sailing from island to island is a seamless and magical experience. El Nido embodies the true meaning of an authentic paradisiacal getaway. Its simplicity and remoteness allow you to revel in the stunning limestone cliffs, secluded and deserted beaches, and inlets that create sweeping seascapes. The main draw for the islands of El Nido in Southeast Asia are snorkelling, diving, and kayaking - and it's no surprise due to the lovely coral reefs and impressive aquatic life. Aside from watersports, dramatic cliffs allow for rock climbing and hiking, paths through coconut groves make way for mountain biking, and local cultural influences have developed cooking courses. Yamba’s long summers entice visitors to its beautiful sanctuary in the Clarence Valley. Located in the southern hemisphere, a visit to Yamba is a fantastic way to escape the cold of the north in the winter months. This coastal holiday town has all the amenities of your quintessential tropical getaway - idyllic beaches, great cafes and seafood restaurants, as well as plenty of activities and water sports. What’s more, the long stretch of undeveloped coastline is home to a world-famous surf break for which Yamba is best known. Accommodation ranges from Yamba’s award-winning youth hostel and rustic-chic farm stays, to luxury retreats, depending on your preference. Further south than its heavily trending neighbor, Tulum, Bacalar is a natural paradise that merits a visit for several reasons. It is the home of Lake Bacalar - termed the “Lake of Seven Colors” because of its multi-hued waters. Lush mangroves and fossil formations conceal treasures, including some of the oldest organisms in the world and pirate loot from the 17th and 18th centuries. This fisherman town also houses the Uchben Kah Ecotourism Park, where swimming, snorkeling, and diving are encouraged in the lagoon. Because of the pristine preservation of local Mexican culture, Bacalar is ideal if you’re looking for a blend of tropical atmosphere and tradition. Saranda experiences five months of summer and is a dream-like tropical paradise. Pebbly beaches and olive trees distinguish it from your typical palm trees and powder sand, making the Albanian “capital” a charismatic Eastern European seaside getaway. Here, you can stroll the promenade with ice-cream in hand from a local cart, wade in the Ionian Sea, or simply take in the archaeology, pastures, springs, rivers, flora, and mountains that surround you. 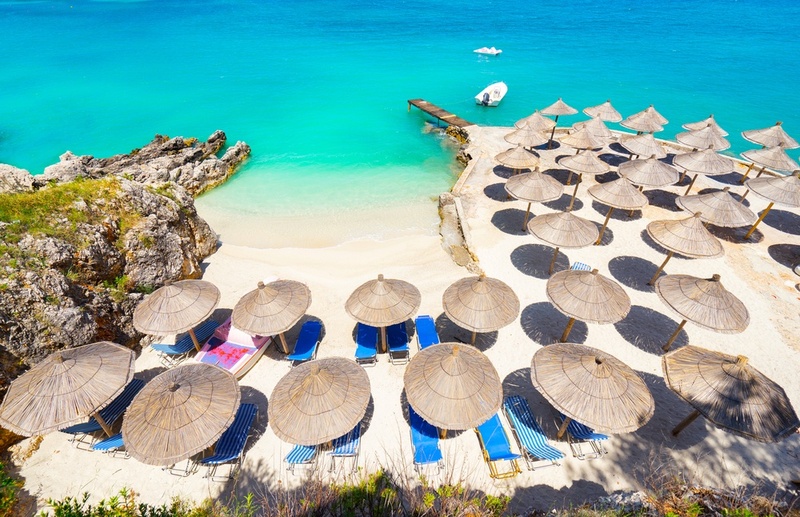 The Guardian had previously named Albania “2009’s hot new beach destination”, however, it has remained a precious and untouched gem of the Mediterranean.